In World Wars I and II, German U-boats hunted and destroyed ships off the Outer Banks. This was "Torpedo Alley," where Germans enjoyed their "Great American Turkey Shoot." From January through July 1942, German U-boats sank 397 ships filled with food, supplies, and oil in U.S. Atlantic waters and killed 5,000 people--a majority of whom were civilians and merchant marines. The U.S. concentrated initial naval efforts in the Pacific. Only one ship was sent to patrol the United States' southeast coast. To protect American lives and vital supplies bound for England, Churchill sent a flotilla of anti-submarine craft to patrol Atlantic shipping lanes. One particular ship, the H.M.T. Bedfordshire*, was torpedoed by a U-boat 40 miles off Cape Lookout on May 11, 1942. All hands were lost. The bodies of four sailors washed ashore on Ocracoke. Donating their services and land for this British Cemetery, the people of Ocracoke took care of the dead. This plot of land has been forever ceded to England and is maintained by the Ocracoke Coast Guard. A ceremony honoring these men, with representatives of the British Royal Navy and the U.S. Coast Guard, is held at the location each year in May. 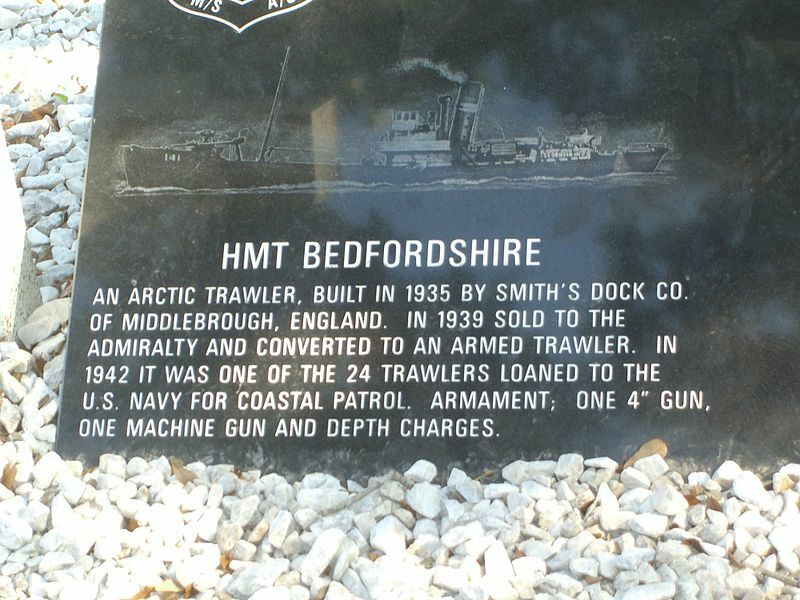 *HMT Befordshire is often referred to as HMS Bedfordshire. HMT is "His Majesty's Trawler", while HMS is "His Majesty's Ship." Referring to the Bedfordshire as HMS, is a gesture of respect. The Outer Banks (also known as OBX) is a 200-mile (320-km) long string of narrow barrier islands off the coast of North Carolina and southeastern Virginia. They cover most of the North Carolina coastline, separating the Currituck Sound, Albemarle Sound, and Pamlico Sound from the Atlantic Ocean. A plaque on Ocracoke Island commemorating those killed on HMT Bedfordshire. The Wright brothers' first flight in a powered, heavier-than-air vehicle took place on the Outer Banks on December 17, 1903, at Kill Devil Hills near the seafront town of Kitty Hawk. The Wright Brothers National Monument commemorates the historic flights, and First Flight Airport is a small, general-aviation airfield located there. The English Roanoke Colony—where the first person of English descent, Virginia Dare, was born on American soil—vanished from Roanoke Island in 1587. The Lost Colony, written and performed to commemorate the original colonists, is the longest running outdoor drama in the United States and its theater acts as a cultural focal point for much of the Outer Banks. The treacherous seas off the Outer Banks and the large number of shipwrecks that have occurred there have given these seas the nickname Graveyard of the Atlantic. The Graveyard of the Atlantic Museum is located in Hatteras Village near the United States Coast Guard facility and Hatteras ferry. The Outer Banks is currently a major tourist destination and is known for its temperate climate and wide expanse of open beachfront. The Cape Hatteras National Seashore has four campgrounds where visitors may camp. Outgunned and out-maneuvered, they heroically battled the deadliest fleet of submarines ever launched. Never was Germany closer to winning the war. In a moving ship-by-ship account of terror and rescue at sea, Homer Hickam chronicles a little-known saga of courage, ingenuity, and triumph in the early years of World War II. From nerve-racking sea duels to the dramatic ordeals of sailors and victims on both sides of the battle, Hickam dramatically captures a war we had to win—because this one hit terrifyingly close to home. In an impressive research coup, Gannon located the former skipper and several crew members of one of the U-boats involved in the campaign. Using interviews with these men and former U.S. and British military personnel, and a war diary of the U-123 , Gannon recreates two action-packed patrols and the sinking of 18 Allied ships by that submarine. The book will be of enormous interest to sub warfare buffs. Includes numerous photos. Fans of the movie Das Boot especially won't want to miss it. The author describes some of the most climatic sinkings such as the USS Huron, the SS Metropolis, and the steam packet Pulaski. He also chronicles the birth and growth of the US Life Saving Service and some of the most exciting rescues in history. Overall this is a fine and engrossing book, written by an author intimately connected with his topic. Includes illustrations, maps, and drawings. From the North Carolina coast to the South Pacific, Quest for Sunken Warships journeys beneath the waves to investigate the shipwrecks and stories forgotten by history. Expert wreck divers explore the world to uncover American history in underwater graveyards of iron and steel. Combines CGI illustrations, archival battle materials, and on-site diver exploration of the sunken wrecks. Even the set itself, which is a replica of a U-boat interior, had no false walls, so all camera angles are necessarily from within its horribly narrow, overcrowded and sweaty confines. The result is certainly the finest submarine drama ever made, and one of the most compelling depictions of the physical, psychological and emotional effects of warfare. This gripping tale from Academy Award® nominated director Wolfgang Peterson follows the daring patrol of U-96 – one of the famed German U-boats known as the "gray wolves." The crew aboard the U-96 is graphically portrayed in a desperate life and death struggle coping with endless hours of claustrophobic boredom at sea which quickly gives way to terror when confronting the enemy. Das Boot delivers an amazingly accurate account of Germany's elite U-boat crewmen as it deliberately depicts the carnage of war. At nearly 5 hours of run time, order a pizza, grab the popcorn, reach for that favorite drink and enjoy one of the greatest classics ever brought to the screen! Das Boot puts you inside that submerged vessel and explores the physical and emotional tensions of the situation with a vivid, terrifying realism that few movies can match. As Petersen tightens the screws and the submerged ship blows bolts, the pressure builds to such unbearable levels that you may be tempted to escape for a nice walk on solid land in the great outdoors--only you wouldn't dream of looking away from the screen. Sources: National Park Service; Library of Congress; National Archives; Official Records of the War of the Rebellion; history.navy.mil; uscg.mil; va.gov; af.mil; US Navy History, Washington, DC; US Coast Guard History, Washington, DC; Hancock, W.K. ; Margaret M. Gowing (1949). British War Economy. History of the Second World War. London: Her Majesty's Stationery Office; Empire Gem (British Motor tanker) - Ships hit by German U-boats during WWII"; "Venore (American Steam merchant) - Ships hit by German U-boats during WWII"; Conn, Stetson (2000) . Guarding the United States and Its Outposts. Seattle: United States Army Center of Military History; "NOAA, National Oceanic and Atmospheric Administration.